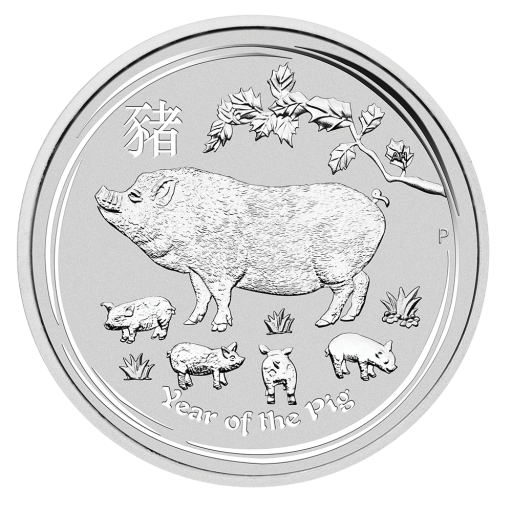 The 2019 1/2 oz Lunar II Year of the Pig silver coin can be ordered now with coininvest.com. The finale of the Perth Mint's acclaimed Lunar II series, the 2019 1/2 oz Year of the Pig silver coin offers all the impressive design details of the ever-popular 1 oz 2019 Lunar II Year of the Pig silver coin at a more accessible price. Based on the animals of the ancient Chinese lunar calendar, the series is one of the mint's most successful. The pig is the 12th and final animal in the cycle and this beautifully designed .9999 silver coin captures its traits with flair. Reverse - a pig stands under a leafy branch with her piglets at her feet. Also features the mint's 'P' mintmark and the pinyin characters for 'pig'. 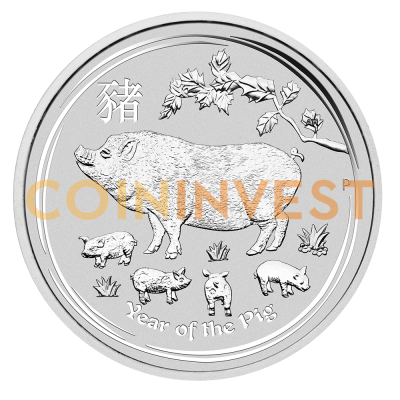 Buy your 2019 1/2 oz Lunar II Year of the Pig silver coins today with coininvest.com. Individual coins come in plastic capsules or investors can opt for 20s packed in foil or boxes of 100.